Technology and space have always gone hand-in-hand. The first manned Apollo missions to the moon used several computer’s systems including their guidance system which is regarded as the first embedded computer. While it weighed in at several Kg and has significantly less technology that a common toaster today, it allowed the astronauts to make the 700,000 km round trip. Today, cutting edge technology is used by astronauts in every aspect. But the gap between space technology and consumer information technology is continuing to shrink. Take for example the Reid Wiseman who gained a huge following on Twitter and Vine by sharing his training experience before his launch. But he didn’t stop there. He continued to share selfies and amazing shots of hurricanes from space. This real-time connection with the world and his followers renewed many peoples excitement for space programs in general. 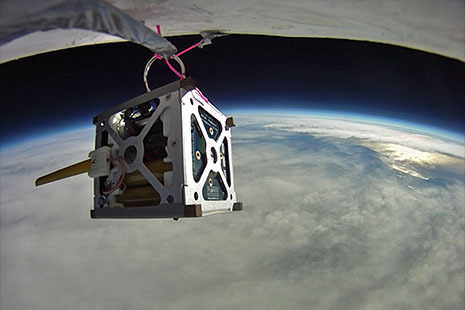 Another example of the blurring lines can be found in NASA’s recent experiments using off-the-shelf smartphones to power a series of satellites. While these phones will likely not be used to talk to friends about their weekend, the project will hopefully demonstrate that these consumer-grade solutions can be used in space applications and determine how long they can survive in the higher radiation environments outside our atmosphere. As these Internet technologies continue to spread throughout the world, and beyond, global access to IT will continue to fall into the hands of every person allowing us to connect with each other and beyond like never before. Noosphere Ventures is always on the lookout for the next big thing and has never limited its search to the earth!